1st game juz now.. South Africa Vs Mexico.. So they were share da same point.. 1.. So now, juz waiting match between Uruguay Vs France..
Hope france can show da bes game after a bad perfomance during freindly match with china.. Shame!!..ok.. Back 2 da game juz now..
South Africa's players were singing as they came down the tunnel before stepping out into a wall of noise inside Soccer City. But after referee Ravshan Irmatov blew the first whistle of these finals, it was Mexico who looked the team in tune. Their positive start might have yielded the earliest goal of any FIFA World Cup Opening Match as Alessandro Dos Santos nearly struck inside two minutes. Paul Aguilar delivered a low cross and when goalkeeper Itumeleng Khune failed to smother it, Dos Santos looked poised to bury the loose ball only for Aaron Mokoena to make a vital block. Once or twice South Africa’s interpassing almost opened up the Mexico rearguard only for the final ball to go astray. But it was not for nothing that South Africa entered this contest unbeaten in 12 games and home hopes rose before the break when Tshabalala whipped in a dangerous ball that Katlego Mphela just failed to get his head to. 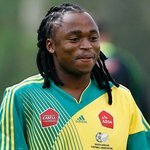 It was Tshabalala himself who made the breakthrough by concluding a four-man move in spectacular style ten minutes after the restart. 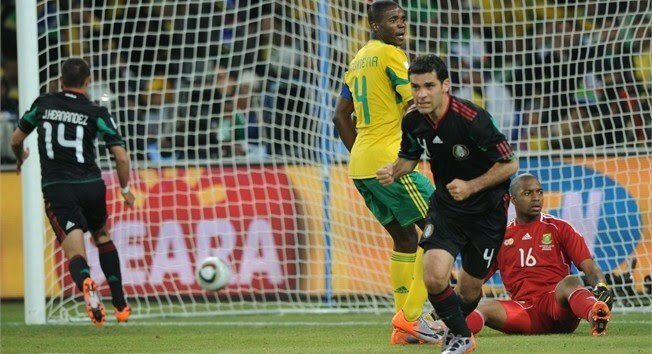 Rafael Marquez denied South Africa a dream start to their FIFA World Cup with a late equaliser for Mexico in a 1-1 draw in an absorbing Opening Match at Soccer City.